With a little planning, juice fasting can work well for you even if are out at work most part of the day and the week. Here are some practical tips you can use. If you work away from home but want to do an extended fast, juice fasting might pose a bit of a problem. But with a little planning, it can work for you. As mentioned in other articles in this Juice Fasting Section, to do a safe and effective fast, I always suggest that you invest in a good gear juicer if you can. Not only does it preserve the most nutrients and enzymes in your juices, it also reduces oxidation of your juices for far longer compared to the juices extracted using a centrifugal juicer. During a juice fast, what you want to achieve is to get as much of these as possible into your body to nourish your cells: vitamins, minerals, enzymes, phytonutrients, antioxidants, liquid. You don’t get any of these from store-bought commercially packed juices. Avoid them, even if they say it’s 100% pure juice, unless you know for sure that they are really 100% pure juice. You don’t want the chemical additives, preservatives, emulsifiers, and artificial sugar in your system, not especially when you’re doing a fast. 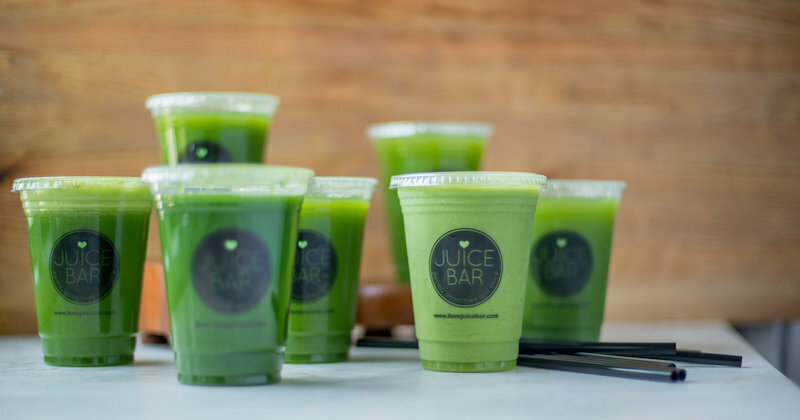 Ordering your juices from a juice bar daily is a good option, if you can afford it. Or even better if you can get a “juice cleanse package” that many juice bars are offering nowadays. During the weekends, you may prepare your juices in advance for the next couple of days (using a masticating juicer). Store your juice in mason jars in the fridge and make it easy to grab a jar for a drink anytime of the day. Here is a juice cleanse recipe that is very nutritious. Cucumber, wheatgrass, barleygrass, lettuce, endives, spinach, celery, watercress, cabbage, zucchini, beetroot, carrots, turnip, tomatoes, asparagus, green apple, lemon/lime, etc. See this page for some tips on making great tasting green juices. Remember that it is best to drink your juices as fresh as possible. But sometimes this is not an option for some people. Here are some ways to get around it. Just apply any of these tips as it suits you. You will have to pack your juices in the morning before you leave for work. Juice your fruits/vegetables as chilled as possible to keep it cool for a longer time to reduce oxidation. Throw in a quarter or half a lemon (with peel) into your juicer when doing this—it helps delay oxidation. Besides, lemon enhances your juice taste, detoxifies and helps melt away the fats. Invest in the biggest thermo flask you can find/afford. Juices need to be kept away from light and oxygen to preserve as much of the nutrients as possible. An airtight container can work too, but make sure it’s not transparent or in light color such that it allows light in to destroy the nutrients. Fill the juices to the brim so that there is very little oxygen in the container. (The “dark side” of oxygen is what causes oxidation). Also read: How to store your freshly-extracted juices for maximum nutrient retention. If you can afford the luxury of space and time in your workplace, buy (or borrow) another unit of juicer and keep at your workplace for the duration of your fast, to make your fresh juices. You need only do your juicing once during your lunch time. Store your juice using the method given in the point above. If you have a fridge in the office, it would be helpful too, for storing your juice. And remember to mark your name so no one drinks them! Look around your workplace for juice bars. It might be helpful too, to make friends with a juice bar operator. Be a regular customer, be a friend and see if you can get special discount for buying juices from them two or three times a day. Some juice bar has a loyalty program that can bring down the price of a glass of juice considerably. You can make some green food drinks out of specially-formulated powdered supplements distributed by responsible health companies. This “Perfect Green Food” is a great option for on-the-go, and for some days that juices are not available for whatever reason. Drink according to the dosage suggested. Do drink plenty of water too throughout the day, along with the health drinks. You need not limit yourself to do just a juice FAST. Consider doing a juice FEAST or a mixture of both. This means you drink juices when you can, and EAT the fruits and veggies when you cannot get your juice. Cut up your fruits/veggies in sticks or bite sizes. It can be your carrots, celery, cucumber, lettuce, beetroot, fruits, etc. Put them in an air-tight container and take them to your workplace. Keep them in the fridge at your workplace if there is one. Snack on these throughout the day, if you can’t have your juices. Nowadays, there are many healthy “salad and soup” bars that you can buy salads for lunch. Take a walk during your lunch break, to get your healthy salad. You may also add herbal teas into your regime. Check out this list of herbal teas that you can drink, on top of the juices you’re drinking. Herbal teas can also be very detoxifying and healing and will support your juice cleanse efforts. Sure, there is fiber when you do a juice FEAST. Juice feasting can be very healing too although you will still occasionally feel some hunger pangs. Eat as much fruits/vegetables as you want whenever you feel a hunger pang. If you can commit to work towards at least a 14-day juice FAST/FEAST you might see quite some improvement to your health! Go to the Juice Fasting Section for more articles. How long to juice fast? What juices and how much to drink during a juice fast?